It is perhaps a bit of an obvious subject, but I feel I have mention the temperature. It has been getting progressively colder at each stop for the last couple of days, and it has now reached the point where I can confirm to you that it is “proper cold”. This isn’t a technical term or an absolute temperature, but based on the fact that I can feel the air being sucked out of my lungs as I cough and splutter when making the perilous jump between carriages. Over the last 24 hours on average I would use Sergei’s carriage readings to say it has been around -25C. 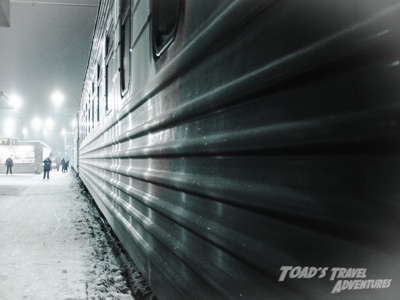 The temperature is getting so low now that I’m wondering if the Baltika in the fridge of the restaurant carriage will be warmer than the supplies in the unheated cupboard next to it. 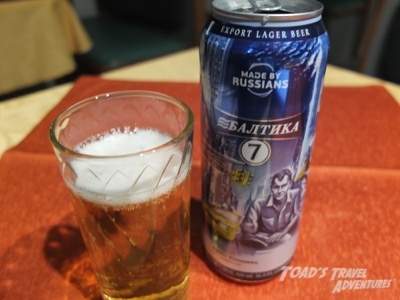 My beer of choice this trip is Baltika No 7. As it says on the tin, “Made by Russians”. I think advertising standards would prevent this line being used by most EU beers today, unless they can prove the pure nationality of their workforce. 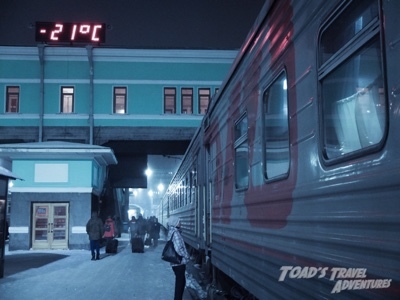 I wondered if it would be even colder when we stopped at Novosibirsk at about 9pm, but it wasn’t. Possibly the heat effect of the city, as it was a slightly warmer -21C. Our carriage is being progressively heated up to combat the lower outside temperature, so it is now +26C inside and -21C outside. The thin skin of the train must be working hard to maintain a 47C temperature differential.